2686-2181 BC, Ancient Egypt The Old Kingdom established a culture which was to endure for 2,500 years. They created an artistic style, a religion, and a system of government and trade network which made Egypt a powerful civilization. Architects and masons mastered the techniques necessary to build monumental structures in stone. Sculptors created the earliest portraits of individuals and the first life-size statues in wood, copper, and stone. Egyptians also surrounded themselves with beautiful objects to enhance their lives in this world, producing elegant jewelry, finely carved and inlaid furniture, and cosmetic vessels and implements in a wide variety of materials. It seems that the Pharaohs organized the first systematic irrigation from the Nile river, which allowed still more people to live in Egypt without starving. 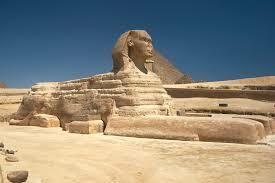 The Pyramids were built in this period as great tombs for the Pharaohs. The most remarkable change is the transition of Step Pyramids to ‘true’ pyramids with smooth surfaces. This transition was not only the result of increasing technical skills but even more of religious views that shifted from stellar to solar. The Step Pyramid symbolized a staircase to the stars. The ‘true’ pyramid, on the other hand, was considered as a solar symbol and as a representation of the primeval mound from which all life had sprung. The pyramid of Pepi II at southern Saqqara is the last major monument of the Old Kingdom. None of the names of kings of the short-lived seventh dynasty are known and the eighth dynasty shows signs of and political decay. During this period, when a new family rose to kingly power, it was the custom to bring the local god which they had previously worshipped to a nationwide recognition. These local deities were in numerous and at the beginning of the Egypt The Old Kingdom, the situation was so confusing that an outright attempt was made by the priesthood to bring some order into it. In Egyptian culture, the woman played an important role. She owned the land, which was passed through her to her daughter. Kingship also passed through the woman. The ruler became king only when he married the daughter of the previous king. The custom of royalty inter-marrying (brother and sister for example) developed because of this. Women were respected in Egyptian society. It was during 2181- 2125 BC that the Egypt The Old Kingdom state collapsed. Egypt simultaneously suffered political failure and environmental disaster. There was famine, civil disorder and a rise in the death rate. With the climate of Northeast Africa becoming dryer, combined with low inundations of the Nile and the cemeteries rapidly filling, this was not a good time for the Egyptians.